Beautiful map of the City of Cartagena, Colombia. Plano della Citta, e Sobborghi de Cartagena. 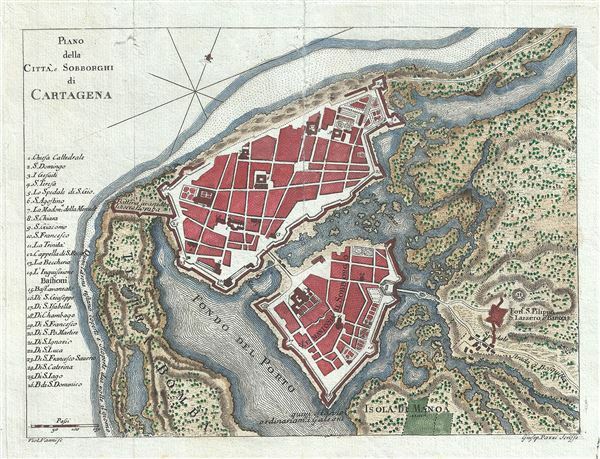 This is an attractive 1763 plan of the city of Cartagena, Colombia by Violante Vanni. It covers the fortified city of Cartagena, located on the northern coast of Colombia. The map is exceptionally detailed and includes a numbered key along the left border identifying twenty six locations on the map. These include forts, churches, cathedrals bastions, etc. The map also notes roads, islands and fortifications throughout, with beautifully rendered surroundings. The fort and castle of San Felipe de Barajas (Castillo San Felipe de Barajas) is identified. Following the famous Battle of Cartagena of 1741 (considered one of the largest naval battles in British history), the city of Cartagena enjoyed what is called the â€˜silver ageâ€™ and witnessed an increase of the economic and political power and subsequent population burst. The colonial walled city and fortress were designated a UNESCO World Heritage Site in 1984. This map was drawn by Guiseppe Pazzi and issued by Violante Vanni in 1763. Very good. Some wear and damage along original fold lines. Original platemark visible. Professionally flattened and backed with archival tissue.